My daughter Djuna Schamus, her friend Hannah Wilton, and I went to volunteer with the Sanctuary Caravan in Tijuana at the beginning of January. This is her report. I recently arrived back in New York City after spending a week in Tijuana/San Diego with my mom, Nancy, and my friend, Hannah. After receiving training from members of the Sanctuary Caravan (SC), we began volunteering in Tijuana, where SC is standing in solidarity with members of the Central American Exodus waiting at the border by supporting them throughout each stage of this inherently unjust immigration process. The humanitarian crisis in Tijuana, created by the current administration’s prohibiting asylum-seekers from presenting themselves at the U.S. border promptly and directly, is immense and in urgent need of redress. During our week at the border, we witnessed a fraction of the injustices our migrant friends are facing on a daily basis.They, our migrant friends, are leading the fight for their own freedom, and, in doing so, are at the forefront of the fight for a more just world: a world without exclusionary borders, where the dignity and safety of all, rather than racism, U.S. imperialism, and the violent structure of nation-states, guide policy and our futures more broadly. Today, there are thousands of asylum-seekers living in temporary encampments and shelters across the city, many of whom made this thousands-of-miles-long journey on foot. They are exerting their right to migrate and their right, as enshrined by U.S. and international law, to seek asylum. According to these laws, the first step that an asylum-seeker must take is to cross the border and present themselves to immigration officials. 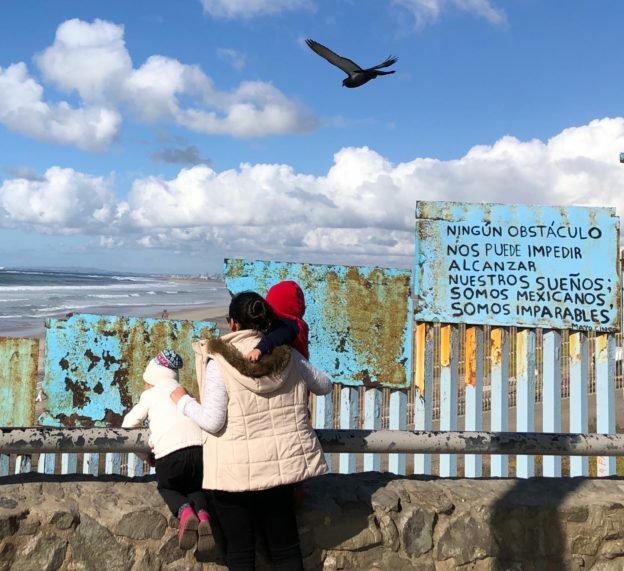 Until recently, those seeking protections could just walk into the U.S. and promptly present their claims for asylum; currently, however, those pursuing asylum are forced to wait in a state of uncertainty and neglect on the Mexican side of the border. A new, unofficial system of entry has emerged in Tijuana, known as “metering,” whereby groups of ten asylum-seekers are each given a unique number and told to return to a public plaza next to the San Ysidro border crossing the day that their number is called. They will not be allowed to cross until their numbers are called. This list, and the ten names corresponding to each number, are managed by fellow migrants in conjunction with Mexican immigration officials. Not only is this system of metering illegal, but it also places individuals in a difficult and vulnerable position, as they do not know exactly when their number is going to be reached or how many numbers are going to be called on a given day (this number ranges from 0 – 80 people per day). Furthermore, El Barretal, which is the largest shelter in Tijuana and currently houses around 1,000 individuals, is a 15-mile trip to the San Ysidro border crossing, compounding the obstacles created by this system of entry. When someone’s number is announced by coordinators at the plaza, they must arrive at the border, with all of their belongings, prepared to cross. People wait in a line along one side of the plaza before being driven by Mexican immigration officers across the U.S. border, where they will likely be placed in detention centers and potentially separated from family members. While always following the lead of our migrant friends, members of the Sanctuary Caravan assist people through this process at every step. The aim of this work is to empower our friends as much as possible under this inherently unjust immigration system. This effort includes explaining, to the best of our ability, what one should expect going forward, giving rides to those whose numbers have been called, providing a welcoming resting place for people scheduled to present themselves at the border, helping individuals fill out immigration paperwork, and prep for the “Credible Fear Interview” that they will request from a U.S. immigration official shortly after arriving in the States. ; this re-traumatizing interview, which aims to assess whether people seeking protection can demonstrate a “credible fear” of harm if they return to their home countries, will determine whether or not they can continue with the asylum application process. During our time in Tijuana, while we continued to make the Sanctuary Caravan our principal organizing hub, because neither Hannah nor I speak Spanish, we ended up being additionally useful as volunteers with World Central Kitchen, an organization of chefs responding to hunger and poverty. At a closed-down restaurant in Tijuana, with the radio continuously blasting dance music, a group of chefs, volunteers, and local workers cook two fresh meals for 1,500 people daily, delivering the food to shelters scattered throughout the city. After our first day of washing dishes and chopping vegetables, Hannah and I, accompanying a longer-term volunteer, travelled 15 miles to the dinner service at El Barretal encampment. The over 1,000 people in Barrtetal live in densely situated tents, mostly set under the open sky. We were immediately welcomed by residents, who have come to anticipate the meals’ arrivals each day. With assistance from El Barretal residents, we distributed penne bolognese and salad to over 800 people (many of whom were women and small children, for whom men in the front of the line always gave up their spots). After dinner, we walked through the camp—through tents, groups of playing children, and friends congregating around a small television playing Alice in Wonderland—finding ourselves at a Three King’s Day ceremony, where residents prayed and sang alongside a visiting pastor. While many of people’s basic needs are being met at El Barretal—with food from World Central Kitchen, medical care from Doctors Without Borders, and aid from UNICEF— life in a de facto refugee camp is precarious and untenable. And, of course, there is something deeply problematic with having the “answer” to an issue, largely created and exacerbated by U.S. foreign policy and immigration policy being an influx of nonprofits and aid-based relief. In addition to visiting El Barretal, and along with other members of the Sanctuary Caravan, we spent time at the second-largest shelter housing members of the Central American exodus, located in a warehouse beside the Benito Juarez sports complex close to the border. Immediately following our arrival in in San Diego/Tijuana, Mexican authorities issued an eviction notice to the roughly 100 residents of Benito Juarez, dispatching dozens of Mexican federal police to the shelter and commencing a drawn out struggle over the residents’ right to remain. There was a days-long standoff between residents and organizers working in solidarity with them, on the one side, and the Mexican government and police, on the other. Answering the call of migrant friends living at Benito Juarez, volunteers with the Sanctuary Caravan and other organizers on the ground camped out on the street in front of the shelter when the threat of immediate eviction was at its height: at one point the police, dressed in riot gear, were no longer allowing water into the shelter or permitting residents to use the port-o-potties, leaving those inside without sanitary toilet options. In the middle of the night, organizers, harnessing their privilege as U.S. passport holders, acted as witnesses to the Benito Juarez residents’ struggle to remain in place. Although an unfortunate reality, it is likely that having American citizens present on the scene prevented a forceful removal of those living in the Benito Juarez shelter. A few days after we left, the final residents agreed to leave the location, many of them transferred to El Barretal. In addition to working in solidarity with those in Tijuana, volunteers with the Sanctuary Caravan are working to expand their support for people being released from detention in San Diego and leaving for other parts of the country, as, in many ways the arduous asylum process just begins after they have finally made it onto U.S. soil. It is important to note that every person going through this process will be promptly be put into deportation proceedings; their asylum application is their defense against deportation, but the threat of deportation is ever-present. The convoluted and dehumanizing system of ICE check-ins, immigration hearing dates, and the reality of living with uncertain and precarious status can continue for years, and it is imperative that people feel welcomed, supported, and empowered throughout the entirety of this process. Undergirding this work are the convictions that the freedom of movement/migration is a human right, that no one should be deported, that ICE be abolished (and not merely replaced by an analogous entity), and that we should strive for a future without exclusionary borders. In the last few weeks, and thanks to your contributions, we were able to raise $4,175 for the Sanctuary Caravan movement. Thank you again for supporting this work, and for standing in solidarity with those leading this fight for a more just world. My daughter Djuna, her friend Hannah, and I recently spent a week at the U.S. southern border between San Diego and Tijuana as part of a large network of solidarity and support responding to the humanitarian crisisthere and organized by, among others, the New Sanctuary Coalition(NSC) and its Sanctuary Caravan, Al Otro Lado, and the San Diego Rapid Response Network. Here follow some impressions from that week. Each morning at El Chaparral Plaza in Tijuana, some men set up a small red pop-up canopy tent, and other members of the Central American Exodus and other asylum seekers gather around. There is a table, a megaphone, and a battered notebook that contains numbers associated with the names of people who are on a list of those waiting for a chance to present themselves at the U.S. border to request asylum. Each number represents ten people. By law—both U.S. and international—people should be able to go to any port of entry to request asylum, but the current administration has enacted a “metering” systemwhere only a specified number of people is allowed to cross each port on any given day. Since there is a huge backlog of people waiting—at this point the wait can be up to two months—the asylum seekers have self-organized, and a family or a group of men who have been on the list for a while take charge of the notebook. In addition to calling out two batches of names—one in the early morning and one an hour or so later—they give out new numbers every day until noon. When it is their turn to cross, they pass the notebook along to people who are lower down on the list. Each morning a member of Grupos Beta, a service of the Mexican National Institute of Migration, relays from U.S. Customs and Border Patrol (CBP) to the notebook keepers the total number of asylum seekers who will be allowed to cross that day. The total might be 80, or it might be none. It is important to understand that this entire system is illegal, and has arisen out of desperation. A member of the notebook team will use a megaphone to read out the names of people whose numbers have come up. People must keep track of their numbers and when they are likely to be called. Many of them are living in shelters and encampments far from Chaparral, and have to get themselves to the plaza or risk losing their chance to cross. There is an informal grace period of two days, so if your number is called and you miss it, if you can get there within two days, you might still go across. The mornings that I was at Chaparral I saw lots of young mothers with small kids, toddlers, and even infants. In addition to members of the Central American Exodus, many of them from Honduras, there were single men from Haiti and West Africa. After the names are called—and they often have to call two hundred names to assemble a desired 20 people—people line up along one side of the plaza to wait for the shuttle vans driven by Grupos Beta. The vans take people to the other San Ysidro checkpoint where they cross the border to face the bureaucratic nightmare created by the CPB—detention in the Ice Box, separation of fathers from their wives and children, the “credible fear interview,” and so on. The San Diego detention facilities are over capacity, and before we arrived people were being released from detention in the middle of the night, just dropped off at a bus stationor in a public park. The San Diego Rapid Response Network organized shuttle buses to drive around after midnight looking for people who had been dumped, and taking them to shelters. Because of bad publicity, this practice of “dumping” has apparently been suspended. The Sanctuary Caravan has two programs running concurrently. One is the Pro Se Clinic where volunteers fill out intake forms with people who are scheduled to cross the border and help them prep for their credible fear interviews, which is the first step in the asylum process. The Pro Se Clinic’s borrowed storefront has turned into a de facto community center where families hang out and volunteers play with the kids while their parents are interviewed. Volunteers also go to the El Barretal refugee camp, twenty minutes out of Tijuana, to let people know about available services and to do intake. The Accompaniment Program in Tijuana is in some ways more extensive than its counterpart in New York City. In addition to waiting with friends at Chaparral until they board the Grupos Beta shuttles, Sanctuary Caravan also keeps track of friends’ numbers, and has a van that picks people up from El Barretal each morning to take them to the plaza where the names are called. Because Djuna, Hannah, and I don’t speak Spanish, we had a hard time in the beginning figuring out how to plug into the work that was going on. We were cursing ourselves for having chosen French as our second language. Our first afternoon I was called to the clinic to translate for some Haitians, but when I got there it turned out they were Creole speakers and my French was still useless. Djuna and Hannah ended up working with the World Central Kitchen, an organization of chefs addressing hunger and poverty, where they didn’t need Spanish to scrub pots and chop vegetables. I joined them a couple of afternoons and was wildly impressed by the work that was going on. In Tijuana, the World Central Kitchen prepares and delivers three thousand meals a day—feeding 1,500 people at lunch and dinner. The food is fresh, inventive, and made with love. One evening Djuna and Hannah went to deliver dinner to El Barretal, where they saw a thousand people living in tents. Hannah said, “They get meals, UNICEF is there, and Doctors Without Borders, but it’s still no way to live.” If it rains, they get wet. If it’s cold, they are cold. Djuna reported that women and children are fed first, and that everyone pitches in to help out with serving the meals. Meanwhile, back at the volunteer hub, I was assigned to work as a “Story Steward,” which was a data entry and clerical gig supporting the Pro Se Clinic. One afternoon I spent a few hours prepping a large stack of intake files with all the needed forms and materials. 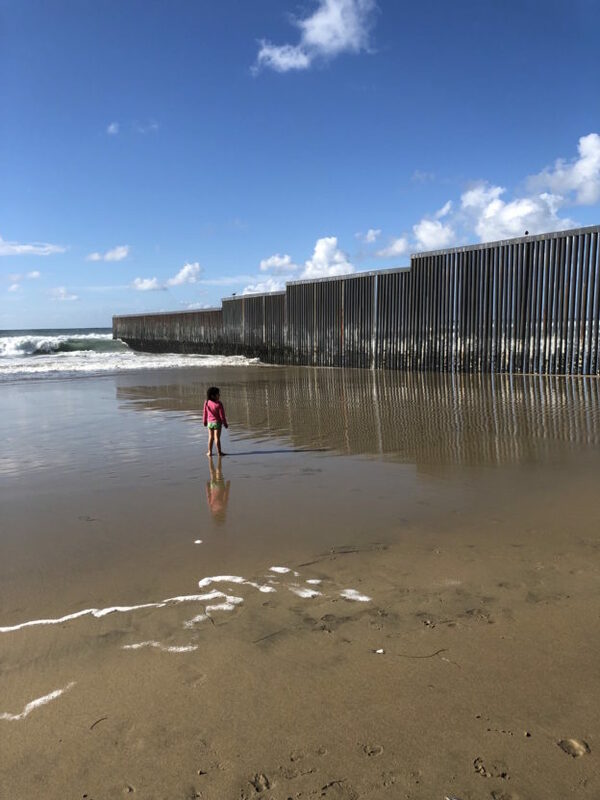 On Sunday afternoon, we went to Faro Playas de Tijuana, a beachfront recreation area, for a religious service that usually occurs on both sides of the hideous and immoralborder wall, which traverses the land, travels down across the sand, and continues into the ocean. Only the gulls could move freely from one side to the other. Of late, because of ‘security concerns,’ CBP has closed access to the International Friendship Parkthat connects both sides of the border and has created a no-go zone on the U.S. side of the fence, so the service occurred only on the Mexican side that day. Through the steel slats, razor wire, and cyclone fencing on the U.S. side, we saw at a distance CBP agents blocking access to the border, and beyond them we made out some of our Sanctuary Caravan colleagues, including NSC Executive Director Ravi Ragbir, who was visiting from NYC. On the Mexican side, there were cafes, restaurants and benches. Couples strolled, families picnicked, and children played in the surf under the shadow of the wall. When we landed in New York City, Djuna and I discussed how it would take a while for us to process all that we had seen and experienced. We had been moved by the dignity and perseverance of the members of the Exodus. We had admired the dedication, humor, and intelligence of the Sanctuary Caravan’s volunteer coordinators. We had been disgusted by the violence, both physical and bureaucratic, of our government’s policies and agents. Two days after we got back from the border, I picked up my work here in New York with NSC, and found out that my local Congressman, who had requested deferred action of removal for my Albanian friends (basically asking that they not be deported), had heard back from U.S. Customs and Immigration Services (USCIS). The request was denied, and USCIS told the parents that they have thirty-three days to leave the country that they have called home for fourteen years. Brooklyn is the only home their three young daughters, two of them U.S. citizens and one with DACA, have known. I sat in a cafe with my Albanian friend and the Congressman’s caseworker as we fought back tears and plotted our next moves. The struggle continues. The beautiful celebrity duck of Central Park, a solo male Mandarin Duck, was first sighted at the pond near 5th Avenue and 59th Street in early October. Mandarin Ducks are not native to North America, and it has been speculated that the duck was an escaped or released pet. In October, I was more interested in the birds flying through the city during the fall migration. The hordes of people lining up to take a look at the Mandarin Duck also kept me away. Standing in a long line waiting for a turn to take a photo of an exotic pet was not appealing. I will admit that this reference to Kim K. piqued my interest, and when a few days later my friend Marie Lee proposed a joint foray into the park to find the superstar waterfowl, I agreed. As we entered the park at 59th Street, we could tell by the small crowd assembled on the north side of the pond where we would locate the duck. As the weather has grown colder, the crowds have thinned so we were able to go immediately to the edge of the pond. And there he was, splendid and colorful, and really so photogenic. 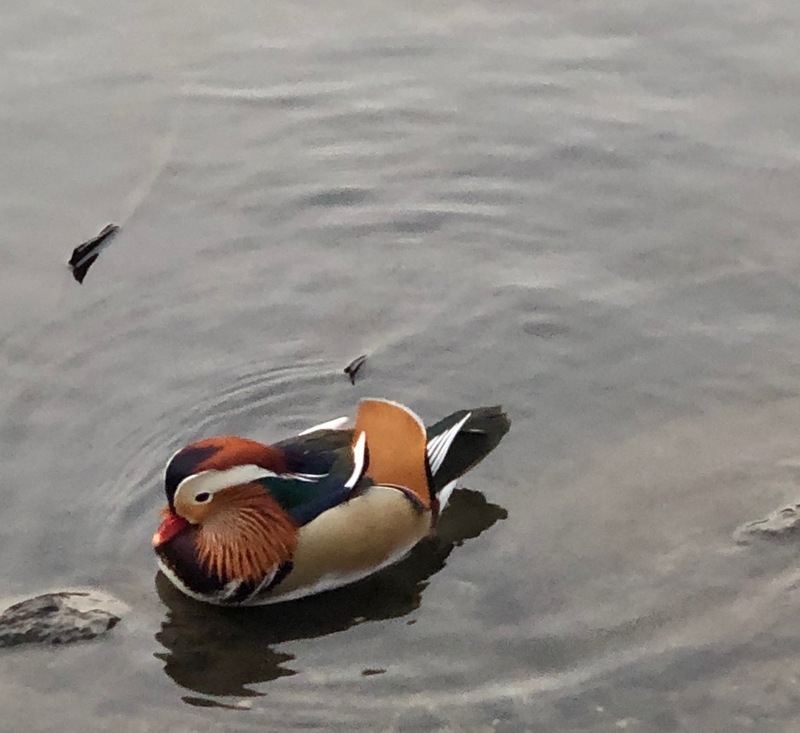 The Mandarin Duck, unfazed by its fans, paddled around among the pairs of Mallards, along with a pretty male Wood Duck, and an American Coot. When I pointed out the Coot—and its prehistoric looking lobed toes—Marie asked, “Is that where the expression ‘old coot’ comes from?” Yes indeed. The Mandarin Duck was definitely worth the trip, although the hype—Mandarin Duck manicures, Mandarin Duck dog jackets—is a bit much. I felt a little sad that I’m not a winter birder as I read about the Saw-Whet Owls and other raptors that people have been sighting in the park. Gabriel Willow, who runs birding classes for NYC Audubon, told me, “There’s no such thing as bad weather, only the wrong clothes.” But I hate the cold, and I don’t have the proper gear, so I’m on birding hiatus until the Spring Migration, except for watching the Dark-eyed Juncos, Tufted Titmice, Black-capped Chickadees, and other birds I can see from my kitchen window in the country. My heart has been heavy this past week, pained by the violence and cruelty unleashed by the vile rhetoric of the people who are running our country. But just yesterday afternoon I had some good news. I heard that the regional director of USCIS has agreed to consider a Congressman’s request for deferred action on behalf of two of his constituents, my Albanian friends, whom I will call Rovena and Altin. In August, an ICE officer told Rovena and Altin that they had 90 days to leave the country. Their stay of removal had been turned down, and they would have to take their three young daughters back to Albania. The girls speak no Albanian, and have known no other home than Brooklyn, where the family has lived for thirteen years. The threat of imminent deportation was terrifying and heartbreaking for the parents, the kids, and for everyone who loves them, including me. I first met my Albanian friends through the New Sanctuary Coalition (NSC) Accompaniment Program in March, and had been at their monthly ICE check-ins during the spring and summer. I had also worked with them at the NSC Pro Se Immigration Legal Clinic through the summer, consulting with volunteer attorneys and with NSC staff about their options. Rovena and I met with a dedicated and passionate immigration caseworker in a Congressman’s office, and we three put together an appeal to the regional director of ICE and his counterpart at USCIS. The request was that, in consideration of the possibly irreparable harm deportation would cause the three girls, their parents be granted discretionary deferred action. The Congressman wrote a letter, and we assembled binders including a family psychological evaluation, a declaration of country conditions from an expert on Albania, along with photos of and school reports for each of the girls, plus dozens of letters from the family’s employers, teachers, neighbors, and relatives attesting to their importance in the community. Yesterday’s news does not mean that they are safe—but it’s a small victory. It means that the dossiers will be read, the ICE deportation clock is stopped, and that there is a chance that they will be allowed to stay. With all the anti-immigrant rhetoric and racist policies being generated daily, so many families and individuals are at risk. There are eleven million undocumented immigrants in this country. There are thousands of Central American asylum seekers making an exodus through Mexico hoping to find safety in our communities, and in response the current administration is sending thousands of U.S. troops to the border and whipping up white supremacist terror in the hopes of swaying the mid-term elections. If the Democrats don’t manage to take control of the House next week, it will be grim. But even if they do, we can’t count on the politicians to save us. 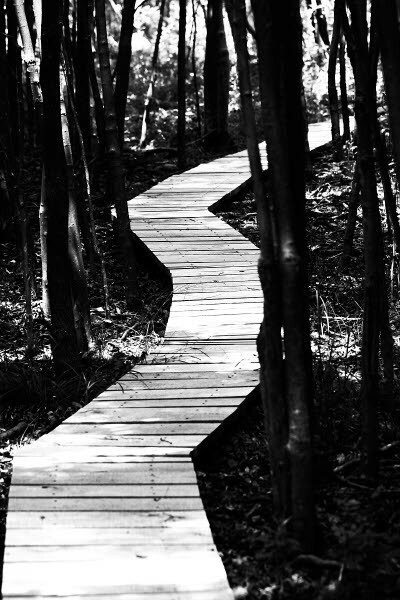 Choose your lane, find your people, and let’s start building the world we want to see. 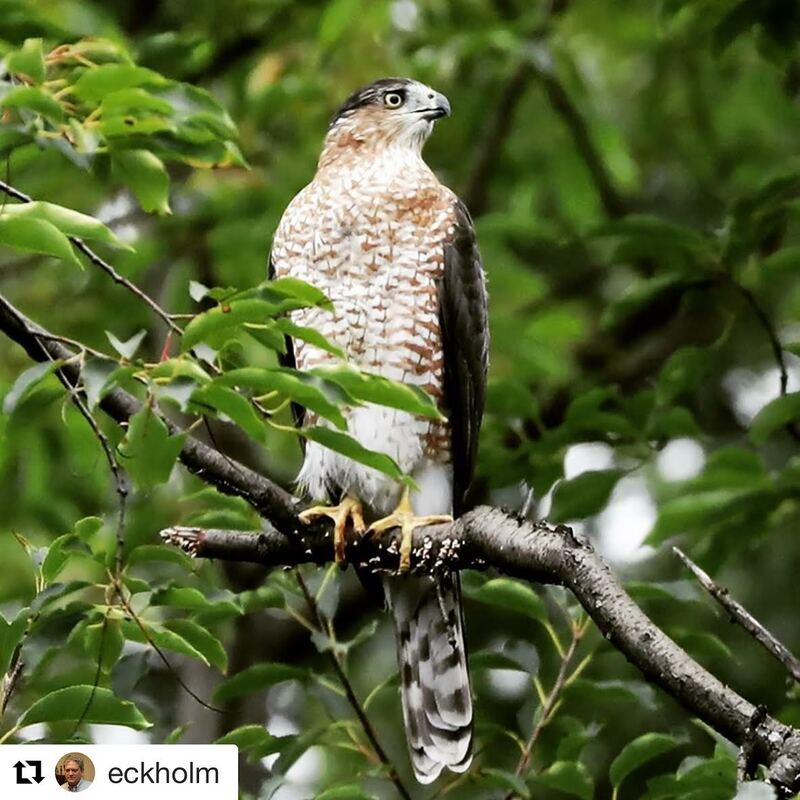 In Central Park last week, on a bird walk in the North Woods led by an Audubon Society naturalist, we saw a Cooper’s Hawk perched regally in a tree, an immature Great Blue Heron fishing in the Loch, four Northern Flickers, and a half dozen species of warblers that were passing through on their way south, in addition to the abundant Blue Jays, Northern Cardinals, European Starlings, and American Robins that call the park home. The fall wildflowers—Canada Goldenrod, Cardinal Flower, Great Blue Lobelia, White Snakeroot, Spotted Jewelweed, and several varieties of Aster—were in bloom. When the cruel and venal doings of human animals are cause for despair, I take solace in the natural world. I was considering delaying this post until after the Kavanagh “situation” had resolved itself one way or the other, assuming that we will be flattened by despair when the Republicans steamroller the Democrats and the rest of us. It has been almost eviscerating to watch the hearings and then follow the sham FBI probe, and the change in tack by the Republicans to undermine and insult the women who came forward with accusations. I have been “triggered” by Kavanagh’s words, his gestures, his petulance, and his arrogance. I wasn’t alone—tens of thousands, if not hundreds of thousands, of women were angry, distraught, and horrified by the spectacle of ruling class white male privilege and power that played out in the Senate hearings and in the political maneuvering that followed. Each day there is a new assault on our values and the most vulnerable among us—migrant children warehoused in a tent camp in Texas, gay diplomats’ partners denied visas, the planned weakening of mercury regulations, and revisions to the Department of Justice web site reflecting a harsher stance on kids who are accused of crimes, to name just a few. But we can’t let them beat us down into apathy and hopelessness. We have to remember the great Soviet Jewish writer Vasily Grossman’s admonition: “In the cruel and terrible time in which our generation has been condemned to live on this earth, we must never make peace with evil. We must never become indifferent to others or undemanding of ourselves.” Grossman lived through World War II, he was a journalist traveling with Russian troops as they liberated Treblinka, his mother was murdered during the massacre at Berdichev, and he survived Stalin’s purges, although his masterwork, the incredible World War II novel Life and Fate, was “arrested” by the Soviets and was not published until after his death. As Grossman put it: “Human history is not the battle of good struggling to overcome evil. It is a battle fought by a great evil struggling to crush a small kernel of human kindness.” I am not so sanguine as to think that individual acts of kindness are enough in the face of the systemic violence and the cruel policies that we are confronting, many of which are just harsher and unapologetic versions of policies that were put in place during previous administrations, both Republican and Democratic. But while we do all that we can through making irate phone calls to elected officials, joining in strategic electoral organizing, supporting grassroots campaigns run by unions and groups on the front lines, and volunteering with local organizations advocating for the most vulnerable people, creatures, landscapes, and institutions, we can also try to make the world a little less dismal by being kind.